You may think you are just one who survives each day, but Karlton reminds us we are so much more. “I said, ‘You are “gods”; you are all sons of the Most High’” (Psalm 82:6). I once heard a preacher say: “You are God.” That was the last time I ever listened to him. Clearly we are not God, and it is ridiculous for anyone to say so. “Jesus answered them, ‘Is it not written in your Law, “I have said you are ‘gods'”‘” (John 10:34). Jesus pointed out that The God called them “gods” because the word of God had been delivered to them. We are not destined to merely live miserable lives of sickness and disease and then die. From the beginning of the Bible it says we were made in God’s image. Throughout the Bible, the laws and rules for living were based upon that fact. We are not to kill, steal from, hurt, or maim our fellow beings made in God’s image. We were made to live with God in our hearts now, and in His presence throughout eternity. Yes, we are something special. Too many times those of us with sickness and disease have been scorned, derided, and looked down upon as inferior. Yet if we only grasped our true calling, we would not be upset, but rather feel pity for those who are too blind to see God’s great plan for humanity and our high standing in all of creation. We are made in God’s image. Those of us who are born again are filled with God’s Spirit, made ready for our eternal destiny to reign with Christ. I say this with the humility of receiving God’s grace and mercy: We need to have a higher opinion of ourselves. Prayer: Dear Lord, too often we think badly of ourselves, forgetting our birth right. Help us to always think better of ourselves while living in Your mercy and grace. Amen. Karlton Douglas lives in Ohio with his lovely wife. He is honored and eternally grateful to be a born again child of God. Who do you think you are? Have you received Jesus as Lord? If so, you are a child of God and have a wonderful destiny awaiting you. 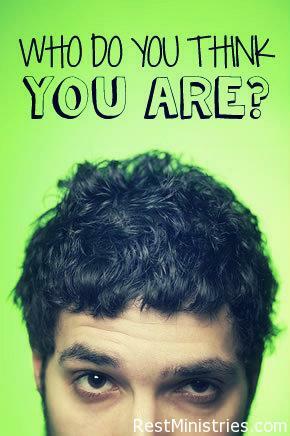 7 Responses to Who Do You Think You Are? Thanks Carlton, what a beautiful reminder. I often forget we are created in God’s image and are His masterpiece. Too often I am my worst enemy as I fling negative thoughts against myself. I think when we are struggling with chronic illness, we tend to throw even more stones at ourselves. I have heard it said that what we would never say to a dear friend, God doesn’t want us to say to ourselves either. Thank you for these thoughts, Karlton, and prompting me to reflect more on who I am in Christ. Thank you Trudy 🙂 We all need to think better of ourselves. It is easy to get self-critical especially when we are feeling down from illness and afflictions. Karlton, your subject sure caught my attention but I was surprised when I read your devotional. It seems to me that we human beings so often get real, legitimate guilt for sin mixed up with the frailties of being mortal creatures. Yes, I agree with you that we are made in God’s image, as the Bible tells us, and so are in a higher, more than special category among other creations. We each have great value to the Lord, our Creator. We have only to look at the cross and its message to be aware of how significant we are to Him. His plan for those of us who suffer from chronic illness is simply different from that of healthy individuals. Our fragile condition doesn’t make us any less important than others, no matter what their position in society or God-given strength. Trudy, I can sure identify with your comments. Thanks for being there. I don’t mean to sound negative, but I didn’t sleep at all last night and feel awful. Not at all God-like, I’m afraid!